Hello my little Christmas Carolers! I was not sure what today’s topic was going to be until I sat down after dinner (last night) and looked up at the Christmas Village. I had already taken the photos so it is a good last minute one. I knew when started this crazy idea that some days I was going to struggle to get it all done. And it is especially hard on work days when I have no time to get anything ready. I did take some extra pictures of random stuff ahead of December that you will see as we go. 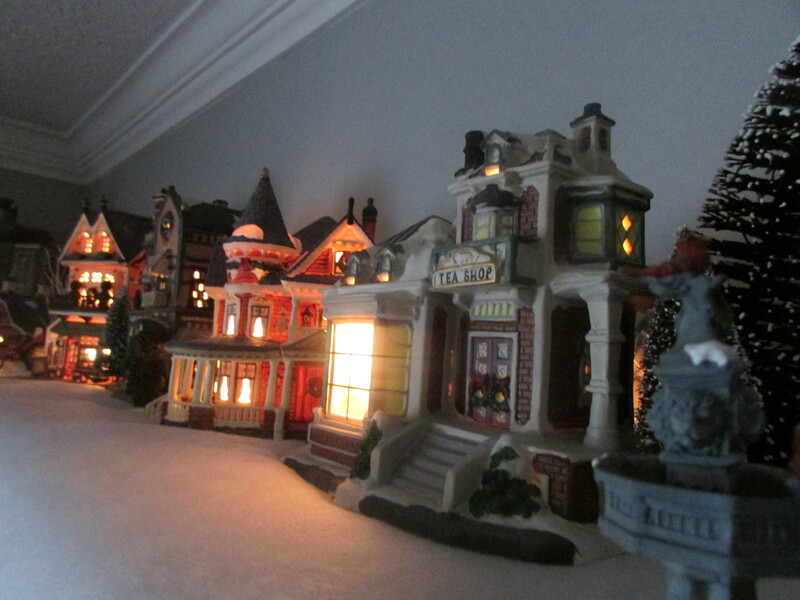 A Christmas Village is an important part of my festive season. My parents always had some kind of village to put up. 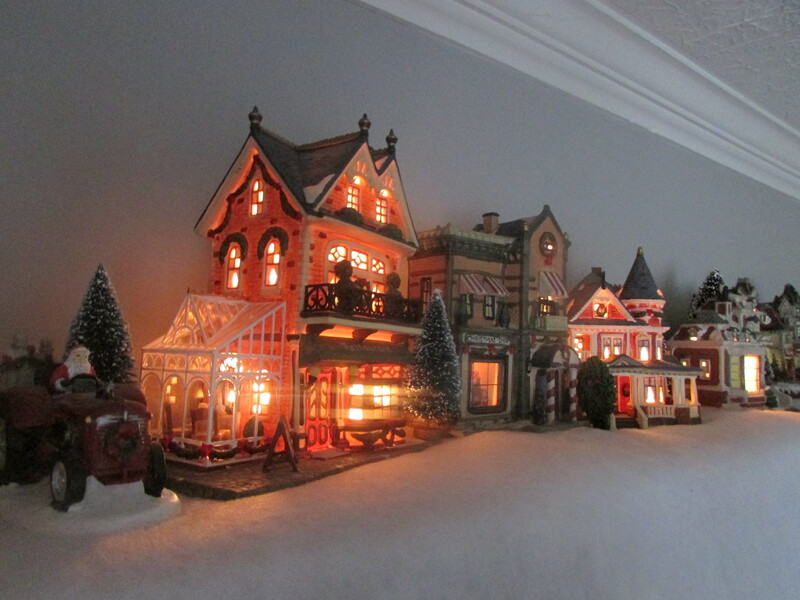 At times my Dad built huge and extravagant multi layered shelves with lights and snow – they were truly magical. I think the idea of a tiny perfect place where the snow is always the right amount, and the happy little people are strolling around singing carols fits in with our fantasies of how Christmas should be. Wouldn’t it be nice to live there? 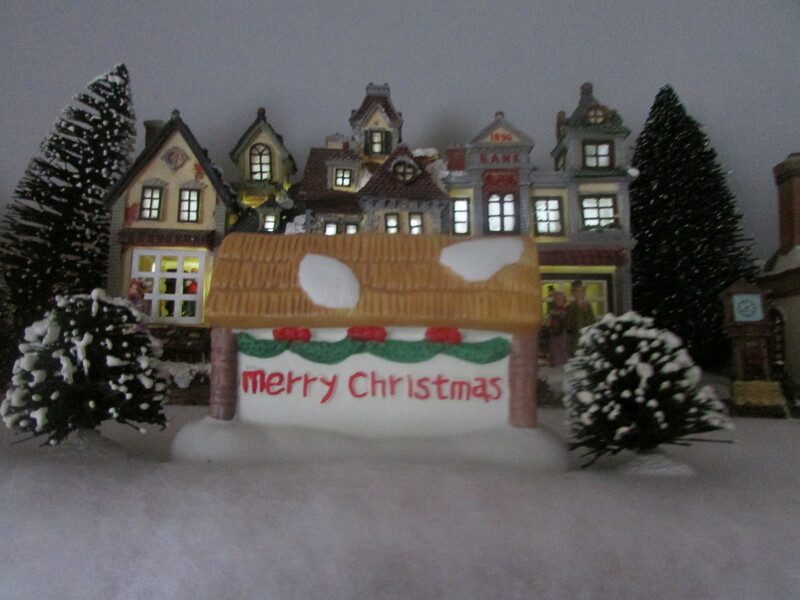 Most of the villages I have seen are Victorian, but in those huge Christmas Stores there are often all sorts of themes. I saw a Dickensian one that I really liked. I also like the ones that are animated and have music. Little ponds with people skating, or carousels that go round to Christmas music. For mine we place a board across the end of the living room wall way up near the ceiling. In part because I don’t have another surface big enough for all my houses and shops. But I also have grown to like the soft lights up there. It is way above the TV and I look at it during commercials. I have ten buildings. The closest one in the picture above is the tea shop. There is a bookshop, an antiques store, a very fancy restaurant, and even a Christmas shop. I only add the kinds of shops I like to go to…it’s my village after all. Now if you are thinking how did you afford so many pieces? Are you nuts spending that much on something that is only out for a month each year…well I am a frugal shopper. I added each one from the after Christmas sales. I started with 3 or 4 the first year when I got to the sales early and there was a good selection – all 50% off. Then I have added one or two for the last few years. I don’t need fancy themed ones, I am happy to create a village with the shops and houses I like. But I really have run out of space on my street. Miss Murfin picked one up for me recently and I have put it in the spare bed room as a night light. I kind of want to get another one to have beside my bed next year. We also have a layer of snow and quite a few trees. 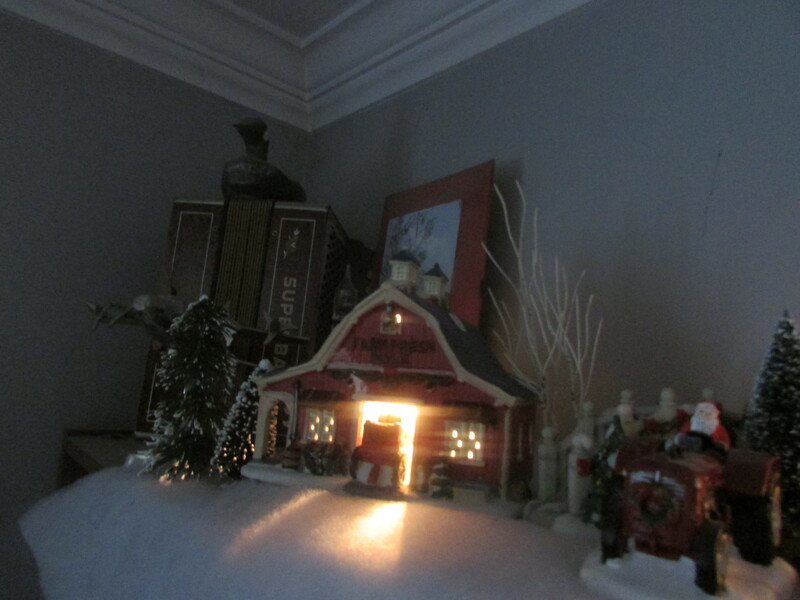 And beside the barn is Santa on his tractor! Not sure if you can see him…the light in the barn is a bit bright. maybe it is elves working on Christmas toys in there. It is so dark at this time of the year, even right after dinner, they add light and warmth to the room. I will miss them when they are put away. But only having them out for a short time makes it all the more special. 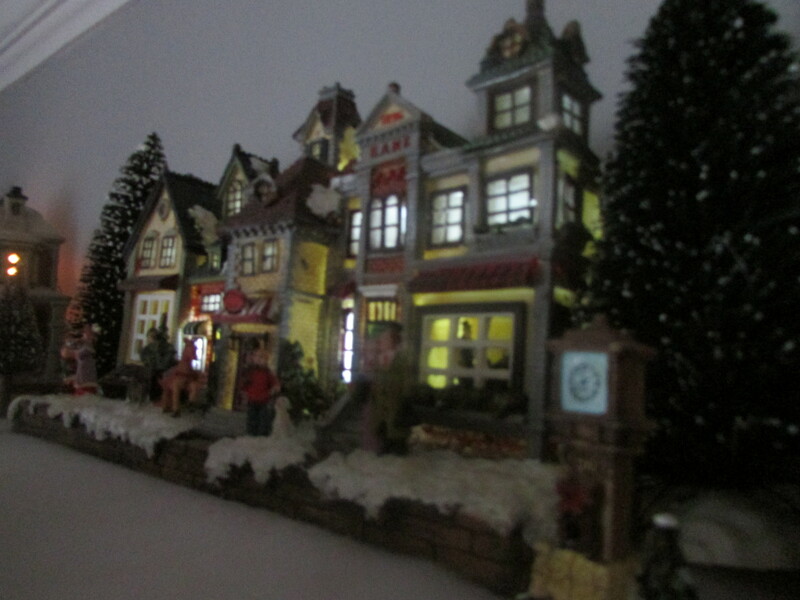 I’m a couple months to the party but I was just looking back through older posts and had to read about your Christmas village because I have one too. 🙂 I was going to write a post about it this past December also but I never got it set up this year so no good pictures. Maybe next year I’ll be able to give it the attention it deserves! haha I did give it a quick mention in my recent post about “5 interesting things about me” which will have to do for now. 🙂 My village is one of my favorite parts of the holiday season. Yes I love my village. It is often the first thing to go up and the last to come down. I love the lights on in the evening, we need all the extra light we can get at that time of year.